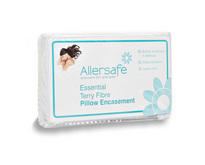 Our sister site Allersafe is moving, don't worry it's not going far, you can get still get all the same top brands, products, expert knowledge and advice right here on SlumberSlumber! Want to find out more from us? 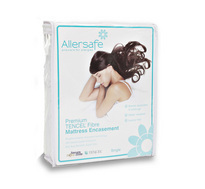 Allersafe bedding dramatically reduces the growth of dust mite allergens deep inside. 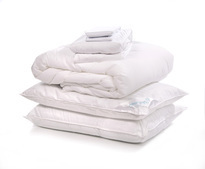 Providing a healthier sleeping environment for those already sensitised to household dust mite allergens and preventing the sensitisation that leads to asthma, sinusitis and allergic rhinitis. 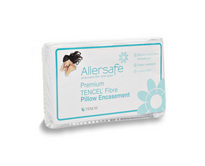 The Allersafe pillow has been blended with Healthguard, an intelligent fibre with anti-bacterial and anti-fungal additives inside, creating an environment that is not suitable for dust mites to survive. 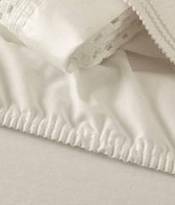 The unique TENCEL® textile combined with our water resistant Breathe-a-Barrier in our Allersafe encasements create a complete barrier between you and the allergens that naturally build up in mattresses and pillows. 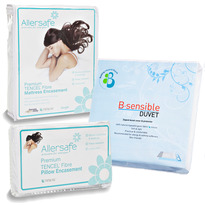 Want to talk to us for more advice on which anti-allergy items are right for you? Call us on 0800 121 4110 (monday to friday 9am - 5pm), or contact us.